Saeble is my gorgeous Beepers BIS, BISS A/C CH. North Face Sno Klassic Glory Days ROM and Bugs CH. PowerPaw Kasaan's Sweet'N T' Fortune daughter. I have waited many years to own a sable and WOW! I finally got my wish!! 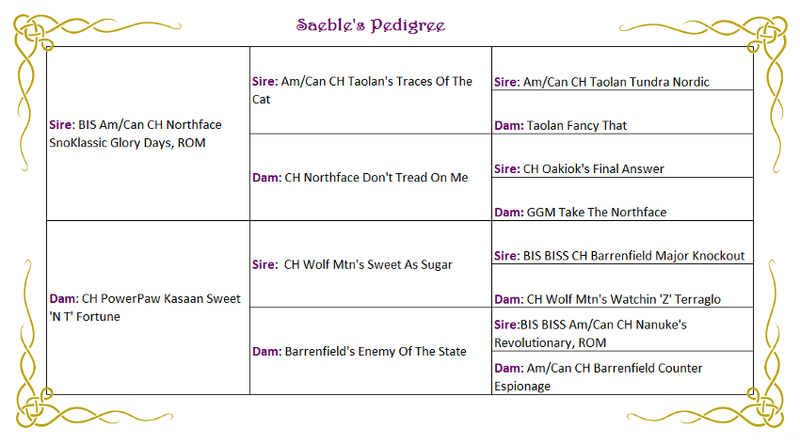 Saeble has very dark eyes, a gorgeous rich sable coat and tremendous side gait. Lovely head piece and an amazing sweet temperament. 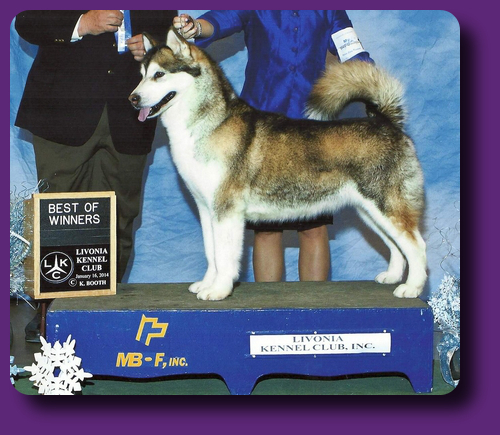 Her pedigree represents the BEST of SNOKLASSIC, NANUKE and TAOLAN!! Adding in a touch of SNORIDGE to round out the pedigree. Built like her mom Bugs, and has the look of her sire Beepers...what more can I say. AWESOME!! Saeble's brother ... Mickey Ch. SnoKlassic Kasaan Imagine That, owned by Tex and Patty Ann Peel finished his American championship with several majors along the way. He was RWD at the 2010 AMCA National Speciality!! Proving she was very capable of proving herself in the 'whelping box' Saeble's children have knocked the show arena by storm. Smooch ~ Kasaan SnoKlassic's Kiss The Fortune has 3 Grandsweeps wins, a 5pt Major Specialty win and a BEST in BRED BY WORKING GROUP , and was AMCA 2013's BEST PUPPY IN SHOW!!! ALL from the puppy class!! Harleigh~ Kasaan's Heart of a Fighter has 12pts, 3 majors, one being a supported Specialty. All from the puppy class!! Saeble has gotten back into show shape and made her show debut 2014. I am confident she will complete her American championship in short time! !